A dinner to serve and enjoy with close friends and plenty of good red wine...a Chianti perhaps. 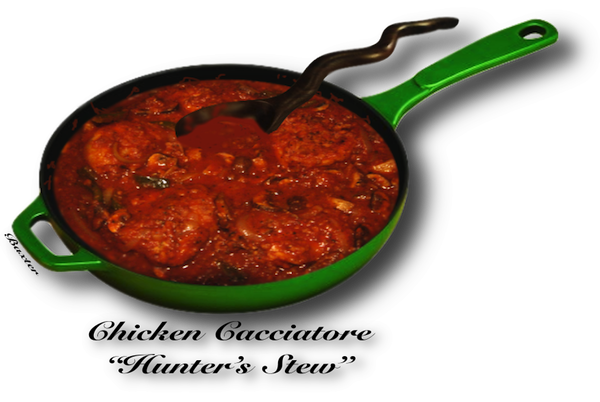 Chicken Cacciatore - Cacciatore meaning hunter's stew. This dish can be used with small game as well as chicken. Try it with rabbit, guinea hen, partridge or some other favorite small game. •  ¼ cup whole pitted Italian green olives. •  1 cup white wine,  The good stuff,  not a cooking wine please. 1. Season flour with salt, pepper, and cayenne. Dredge chicken in seasoned flour to coat. 2. In a Dutch oven or similar heavy kettle, saute onions, garlic, and bell pepper in olive oil until limp. 3. Brown chicken in same olive oil. 4. Add cooked onion mixture and remaining ingredients to kettle. 5. Simmer over medium low heat until chicken is cooked through, 30-40 minutes. Serving Ideas:	Over buttered paparadelle noodles, garnished with sliced Italian green olives. Serve with plenty of crusty Italian bread like as Pugliese or an Asiago.